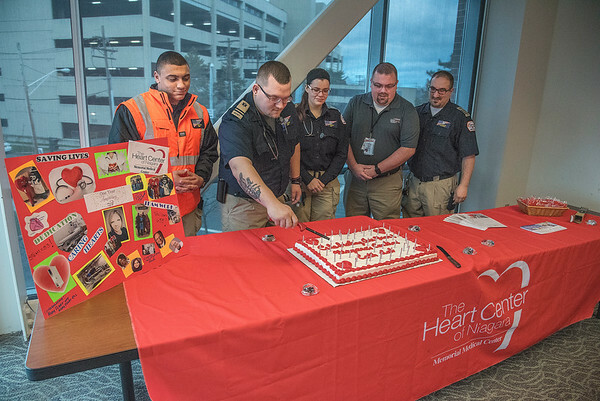 Niagara Falls, NY - EMT Elijah Ventura, Jeremy Klever, Amanda Mrzygut, Paramedic Supervisor Joshua Lengen and Critical Care Flight Paramedic Andrew LaPlante light the candles in part of the Cardiac Catheterization Lab 1 yr. Anniversary. The Heart Center of Niagara and Niagara Falls Memorial Medical Center celebrate the 1 year anniversary of the Cardiac Catheterization Laboratory. Media alert for Wednesday at 9 a.m.
Medical Director Dr. Neil Dashkoff along with some patients whose lives were saved by timely interventions at the cath lab will be on hand to say thank you to the cath lab team and to our EMS partners, the men and women on the front lines who have played such a huge role in the success of this lifesaving facility. Media coverage is invited. Interviews and photo/video opportunities will be available.